Hi, it’s Sundae. (yawn) I have a question for you. (stretch) Do you know what today is? It’s the first day of fall. So, to celebrate, I curled up on a comfy quilt Motor Mommy has folded up in an old wardrobe. Motor Man adapted the wardrobe so the tv would fit in the top section. 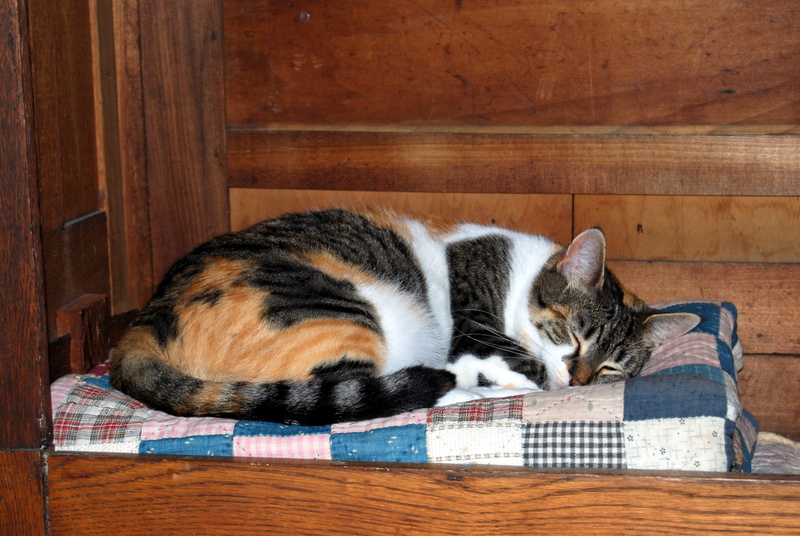 The bottom is just the right place for a cozy nap on a cool day. I just have to snuggle down to get as comfortable as possible. 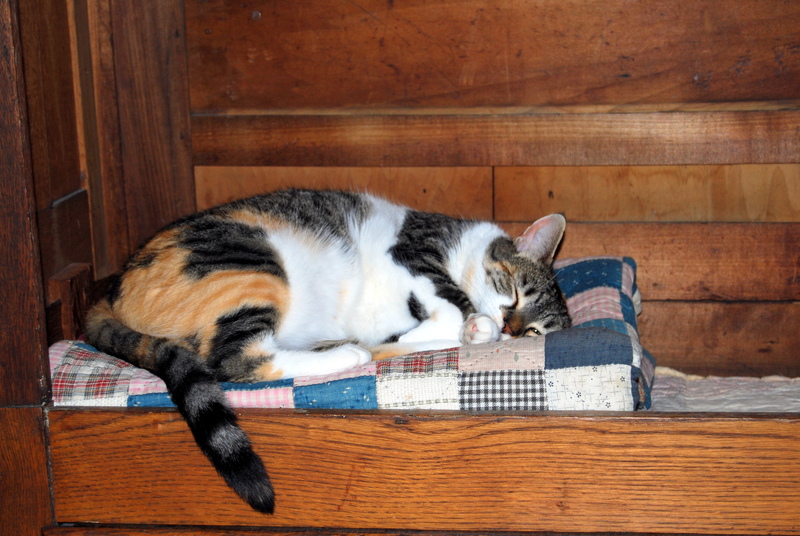 You may be familiar with the Chessie kitty mascot for the C & O Railroad. 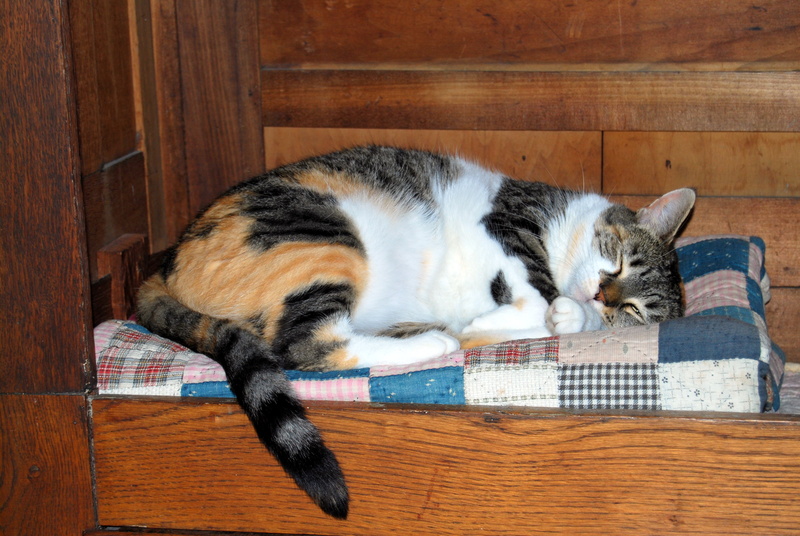 Chessie has always been one of Mommy’s favorite kitties. Since Motor Mommy loves Chessie, I decided to do my best impression of her. See the tiny slit opening in my left eye? Just like Chessie’s. Mommy says I did a good job. What do you think? Happy Fall, everybody! 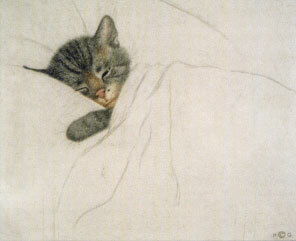 I wish you all some nap time on a soft quilt. I am from silos and linoleum floors and rural free delivery; from a tiny Zenith black and white tv, Barbie dolls and Beatles records. I am from a white house beside a pond, where the frogs sang me to sleep on summer nights; where the scent from a nearby dairy farm was simply bovine. I am from the jonquils and irises along the fence row, snaps, butterbeans and corn from Mama’s garden, and Sweet Williams and peach-colored gladioli from Grandma’s yard. I am from family reunions the first Saturday every August, and aunts and uncles sharing stories of their childhood at Bacon’s Castle; from a Mom named Donnie (after her grandmother) and a Dad named Willie and grandparents, Mae and Ben. I am from dinner at mid-day and supper in the evening, summer days in a big front yard and summer nights in the porch swing. From don’t slam the screen door and it’s just the wind, go back to sleep. I am from Baptist revivals on hot summer nights, Christmas pageants and Junior Choir practice. I am from a small town in Virginia, rich in history, but forgotten by time; from fried chicken and creamed potatoes topped with a spoonful of garden peas. From the nearby country store owned by my Grandma, where we ate ginger snaps and cheese, where customers bought bologna by the pound, and Grandma wrapped it in butcher paper and tied it with twine. 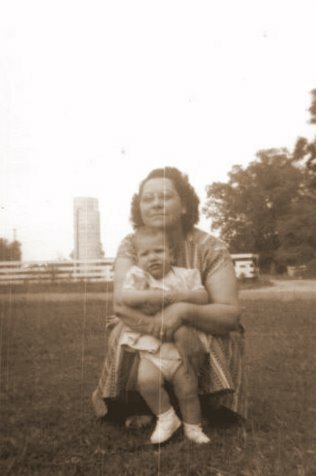 I am from a treasured old blue binder full of pages of our family history, traced back to Jamestown; the dates of more recent births, marriages and deaths penciled in the margins. These are but a few of the people, places and things that shaped the person that I am today. And I’m grateful for each one of them. 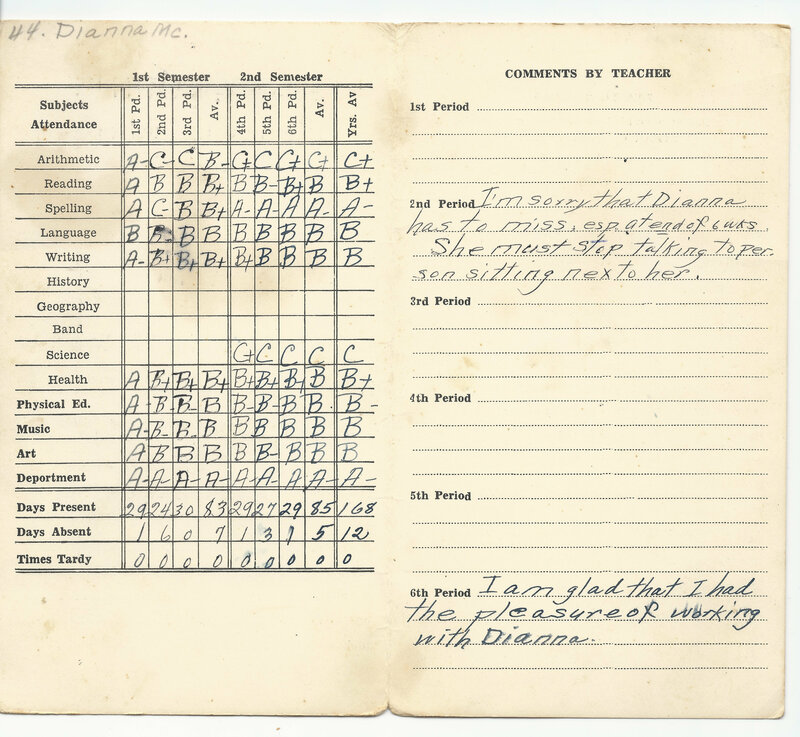 Recently, as I was looking through a box of memories, I came across my elementary school report cards. You can learn a lot about a person by looking at a report card. This is from second grade. From this one little yellowed document, you can tell that Math Arithmetic and Science were not my strong suits, but Reading, Spelling and Writing were better. Those last three are much more important subjects for bloggers anyway. This is my third grade report card. Seems I was showing some improvement in Math and Science. 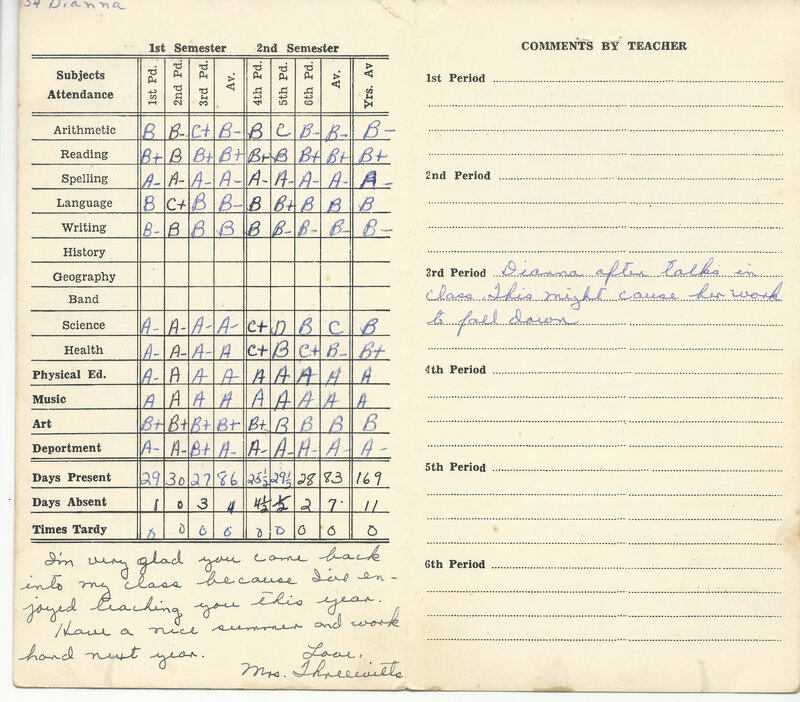 But what really made me realize, when looking back on these report cards, that I was born to blog, were the notes made on the right-hand side by both teachers. See? I had important things to share – even back then. One year ago today, I published my first blog post. It was mostly a self-taught process, with a lot of research and a little help by e-mail from a former co-worker, Jennifer, aka The Cotton Wife. Motor Man still teases me about one particularly challenging evening, when he thought our computer was going to be thrown through the bedroom window. Just to share a few numbers, this is my 315th post, and at last count, I’m one click shy of 37,000 views. I’ve been Freshly Pressed twice, once in April and again in June. Blog-land is an amazing place. I love that I’m able to share snippets of my life with folks all over the world. By the same token, I’m invited to peek inside their lives as they share their world. 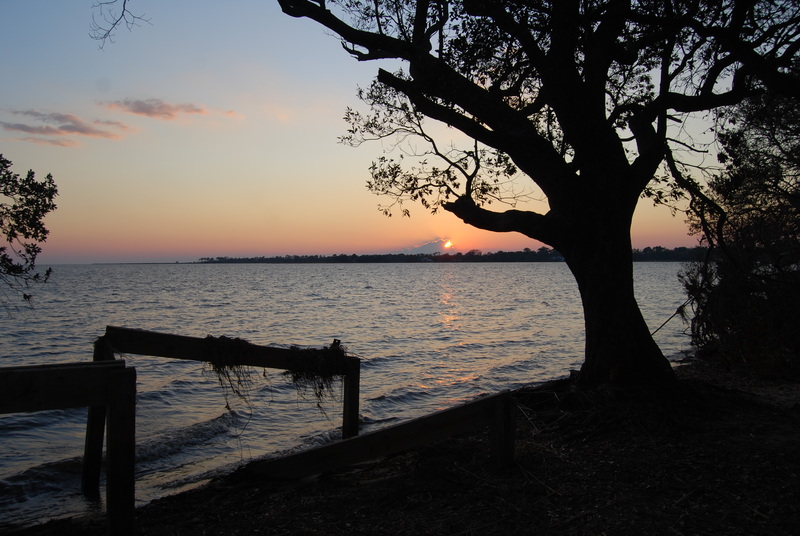 I’m happy when readers leave comments, saying they enjoy reading about our sunrises and sunsets, our friend, Groom Swan, day-to-day happenings, my memories and most of all, my family. Most readers don’t leave a comment, but that’s okay. I once read that even though a viewer may not comment, your post may very well have left them with a smile. Motor Man and my son, Marshall, realize that almost any situation could potentially be blog material. 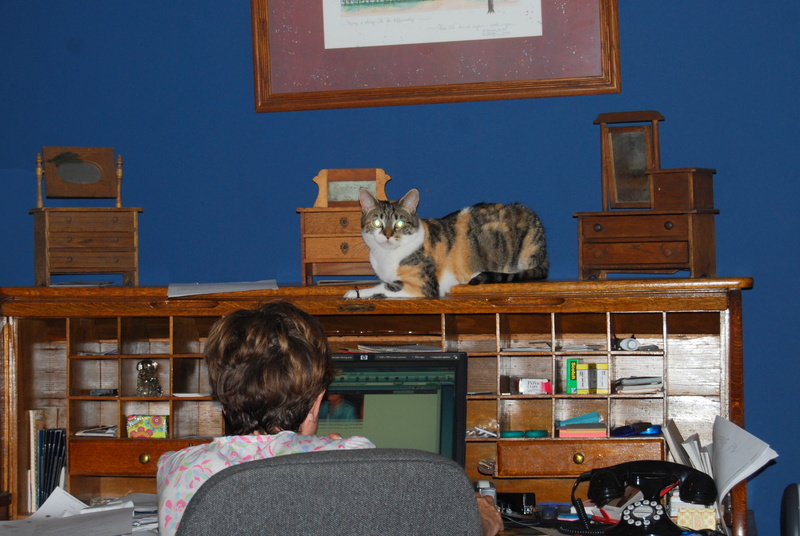 And Motor Man has become accustomed to seeing this view of me almost every night as I work on the next day’s post with help from my green-eyed assistant, Sundae. I appreciate all of you who regularly check in to see what’s happening in These Days Of Mine. Hope you visit often! And whether you post a comment or not, I hope you’re smiling. Tired of sunrise/sunset photos yet? Well, just one more, and we’ll take a break. 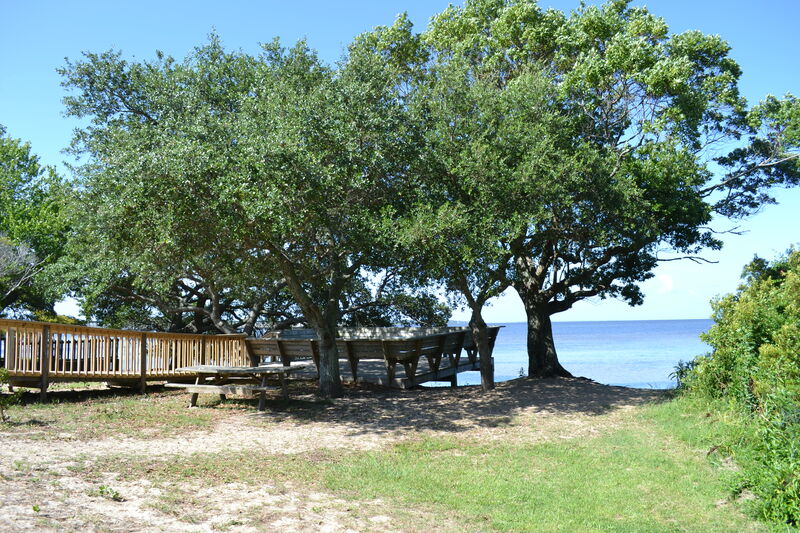 The little park in Kitty Hawk, North Carolina (where the silhouette pictures from Friday’s post were taken) was one we had visited a couple of months ago. 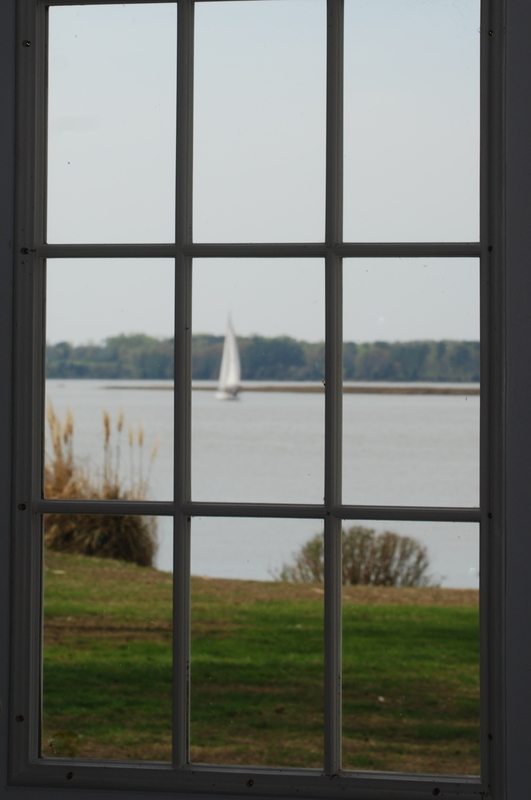 There was a nice walkway down to a deck right at the water. 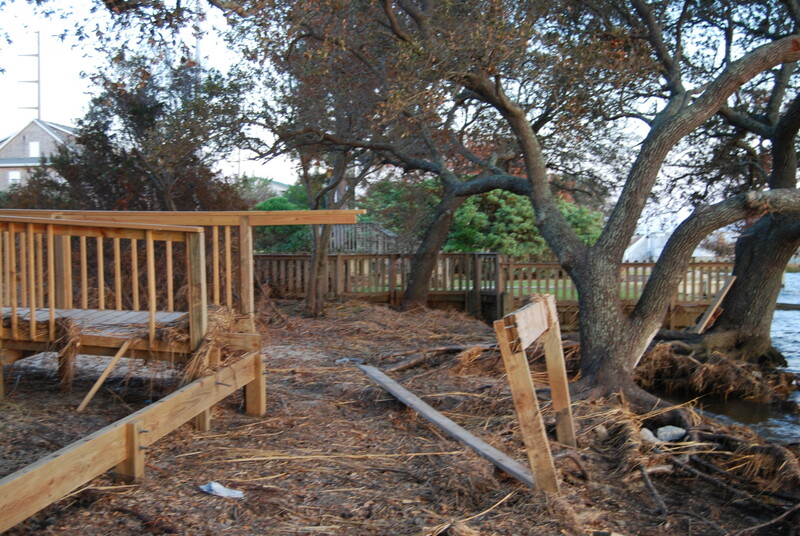 Last week, when we went there, we could definitely see the results of Hurricane Irene. 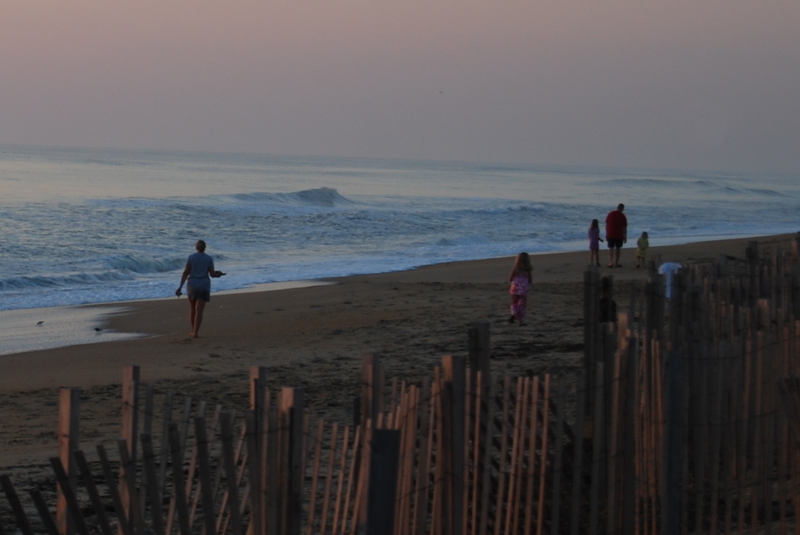 The “sound” side of the Outer Banks was hit harder than the ocean side. 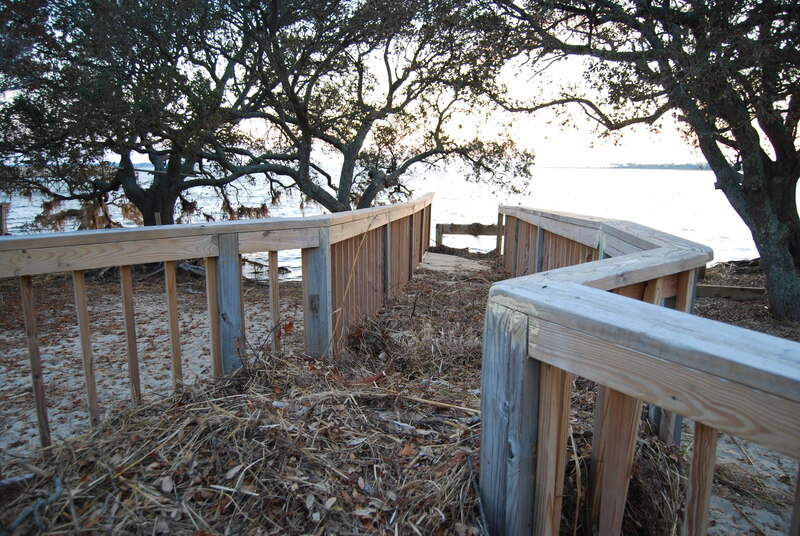 The dock was destroyed, and the walkway was filled with tide debris. But in contrast to all the destruction, there was a beautiful sunset. 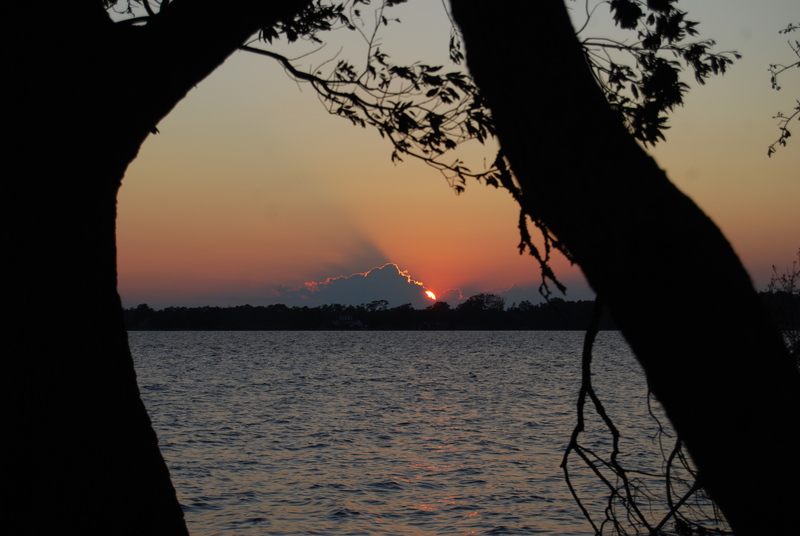 And, I promise, no more sunset pictures until next weekend. That is, unless there’s one this week that’s so pretty, I can’t wait to share. 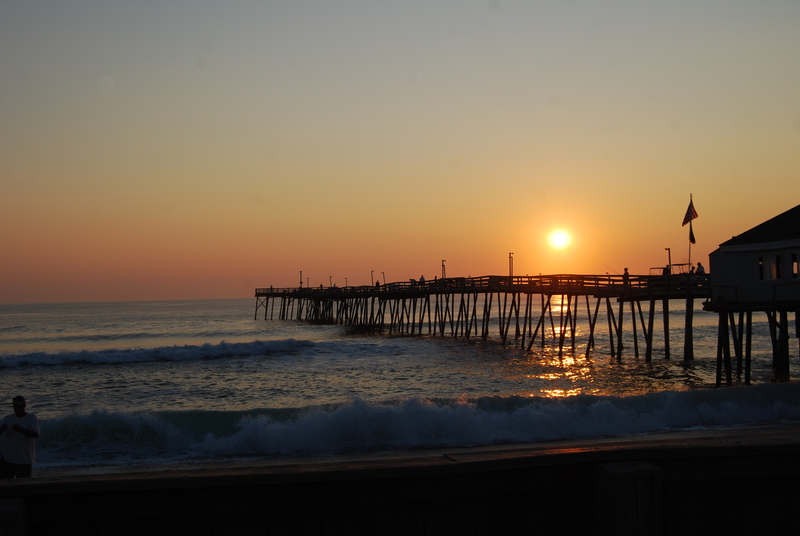 For those of you who aren’t from ’round here, and aren’t familiar with OBX, I’ll explain. 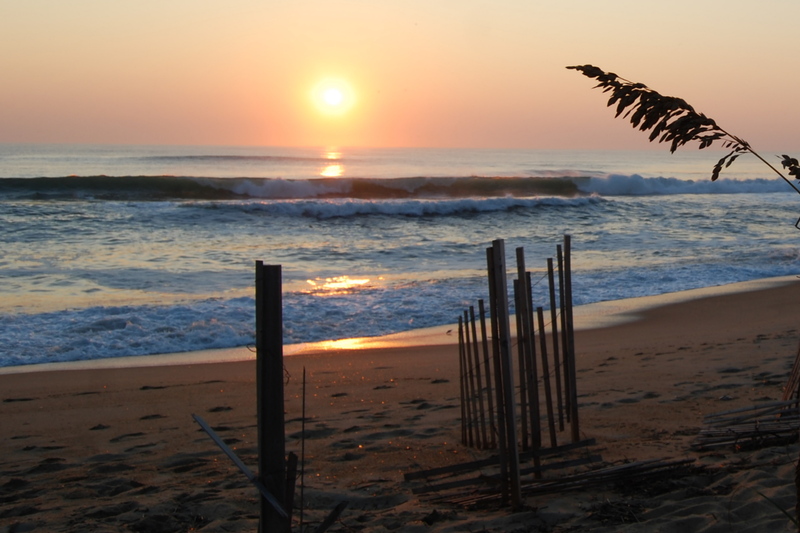 Several years ago, a very imaginative person created “OBX” as an abbreviation for the Outer Banks of North Carolina. That person is probably very wealthy, considering all the OBX decals, bumper stickers, key chains, magnets, and even North Carolina license plates bearing those letters. 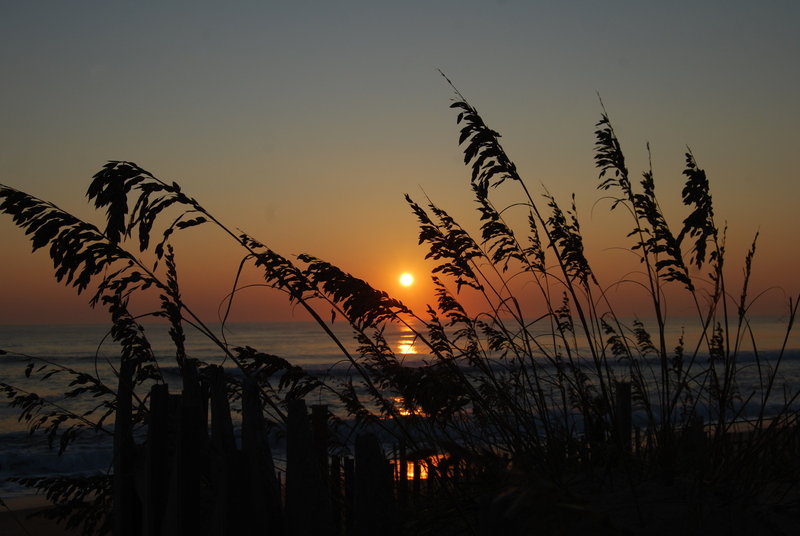 Anyway….Motor Man and I were at/in the OBX last week, and on Sunday, we began our day by watching the sunrise from the beach. See the little sandpiper in the far right corner? He and several of his buddies were putting on a show for us, searching for breakfast while avoiding the surf. 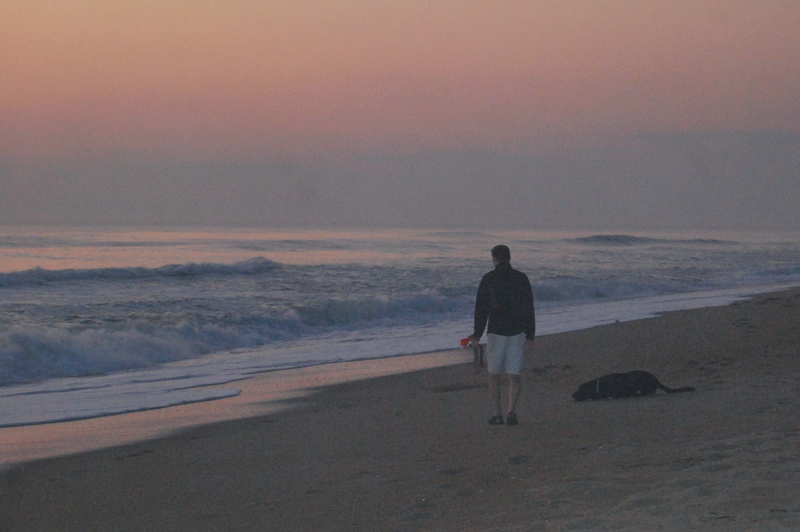 There were a few other folks on the beach, even at that early hour. We laughed at this black lab. He was playing “catch” with a ball and the waves. He would drop the ball and watch it roll toward the water, then crouch down like a cat and wait for the surf to bring it back to him. 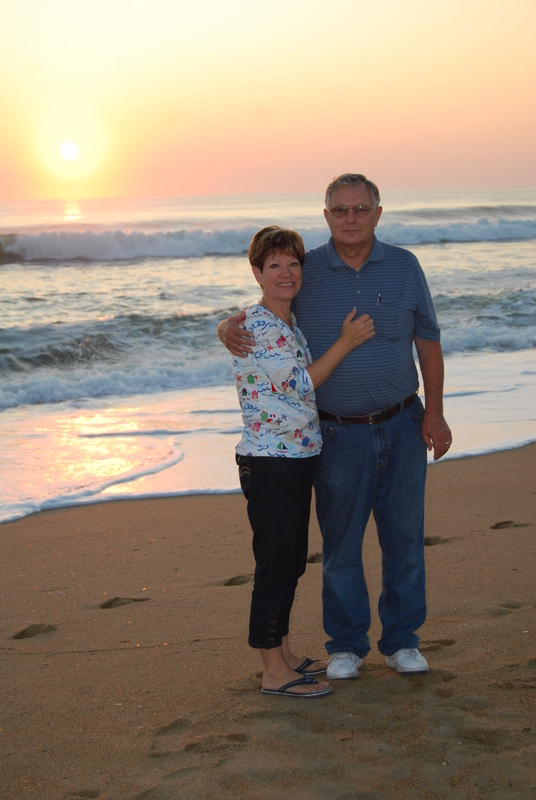 We also met a really nice family from Pennsylvania on their first vacation to OBX. Well, we “sort of” met them: we don’t actually know their names. Their little girls were having fun finding seashells and building sand castles. Their Mom was kind enough to take a picture of us. It was so beautiful, I couldn’t stop taking pictures. 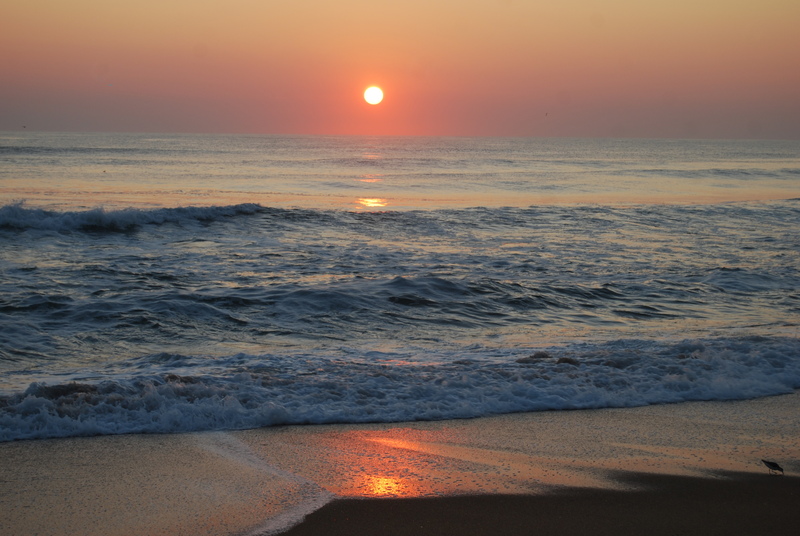 Seriously, if you’re ever on the Outer Banks, the sunrise is worth getting up at o-dark thirty to witness. Yes, Susie, that means you, too.